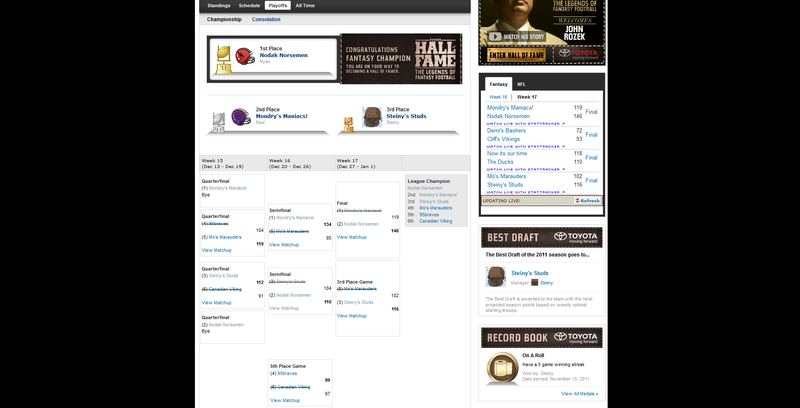 Congrats to Nodak Norsemen for taking me out in the finals, here are a couple screen shots of the standings / playoffs for the league. I definitely had fun, hope to see you guys again next year so I can get my revenge! It was a fun year. I'm looking forward to a better, less injury filled year next year. I lost 4 of my top 6 picks -- Charles, Forte, Best, Britt -- and then DeMarco Murray. I will be more competitive next year! Have a great 2012, everyone. It was a bad season for me this year. Hopefully I draft better next year! Hey guys, ya I'm Nodak Norsemen. 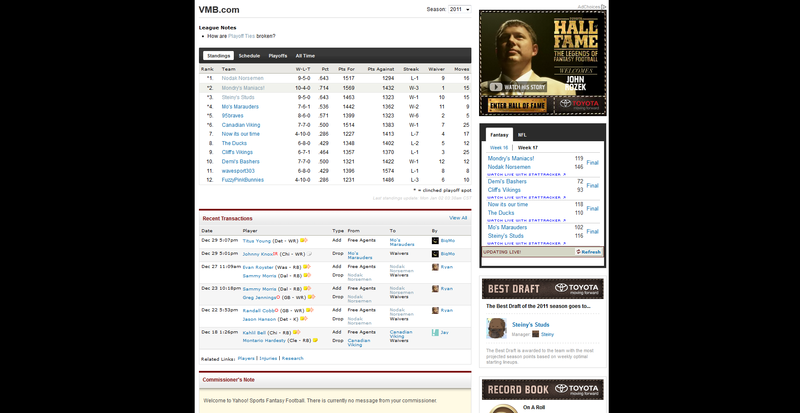 I had a lot of fun, it was my first year in the VMB league and I'll definitely be coming back next year to defend my title! It's nice to get into a league where everyone is active. I was a little worried there at the end of the season when I lost Greg Jennings. When he went down I didn't have much left for WR talent. And ya Canadian Vike, you got seriously bit hard by the injury bug! Hard to be competitive when your RBs keep getting hurt. You still managed to get into the playoffs though. When is the draft now, it was suppose to be in 5 minutes but that doesn't seem to be the case on yahoo any more. We had an odd number of managers when the draft opened (it opens a half hour before the scheduled time). So they canceled our draft and set it to auto-draft on the 8th. we still may be able to do a late live draft, after week one has completed. Not ideal, but we'll still have a league this year.